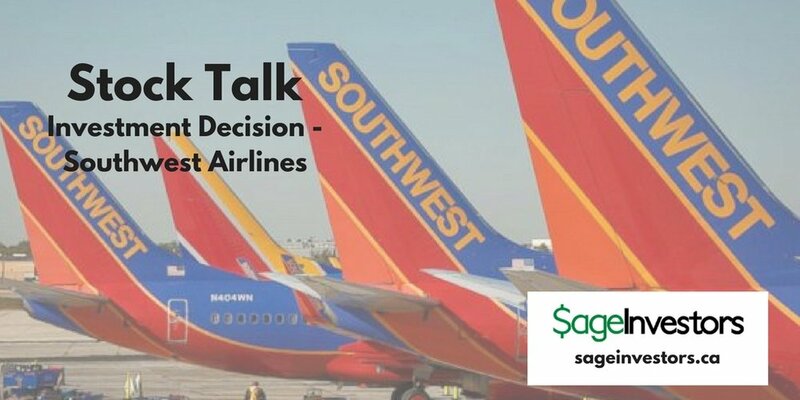 In this part 3 of my Investment Decisions series for March, (iTunes, podcast, mind map video) I walk through the thought process that led me to my decision to buy some shares in Southwest Airlines. This is my second foray into Southwest Airlines. I bought into Southwest in August 2016 and I was able to generate a return of 25.9 percent. The stock has been tracking down the last few weeks so I decided to take a look again and see if there was an opportunity to jump back in. Even though I’ve analyzed the company, I still ask the same 8 questions about the company. Many of my responses are similar to a few years ago so I am not going to reinvent the wheel, but where I needed to refresh the evaluation was on the numbers side, specifically the financial performance and valuation. Here are my responses. As always we go to our good friends at Reuters with their cheat note definition of Southwest. Southwest continues to generate strong Economic Profit. Over the past 3 years, the company’s return on invested capital has come in the 19 to 25 percent range which is much higher than its cost of capital which is approximately 10 percent. Revenues have been growing modestly in the 4 percent range which is inline with the industry. The company has now generated 48 straight quarters of profit, which is amazing. Questions 6: What do they own and who do they own money to? Southwest’s financial position is still quite strong. In fact I think it’s in a stronger financial position than it was a few years ago. It’s under any financial threat. While the company’s ratio of current assets to current liabilities is low, the company has a high liquidity level with more cash in the bank than debt. It is generating enough cash to cover its day-to-day operations. Their debt level is very manageable and quite low for a capital intensive business. Their debt/equity ratio comes in at 0.25 which is pretty manageable. If interest rates continue to track up in the future, Southwest should be able to manage through it. The company has very little intangible assets to the quality of the company’s assets is very high. Out of all airline company’s, Southwest is financially the strongest. The stock has had a pretty strong run and at one point it reached in the mid-$70’s. It has since been slowly falling back to earth. In terms of valuation the stock on a relative basis is still on the pricey side. On a discounted cash flow basis the intrinsic value comes in the $50 to mid-$60’s range, so the stock, even after the recent pullback is appears to be fairly valued. In reality the stock has always been expensive to own, but when you are generating the type of consistent financial performance like they have, you will have to pay a premium, which makes sense. The odds of being able to buy shares at ½ prices are pretty low. Southwest continues to be a best of breed company in the airline space. It really hasn’t missed a step since I last bought in a few years ago. The stock is still relatively expensive right now but given the nervousness of the markets lately I thought it may be a good time to buy a small position right now and buy more shares if it should continue to fall. The management team continues to generate consistent wealth for its shareholders. It is still a high quality business and so I’m happy to buy back into Southwest. I bought in at $55.